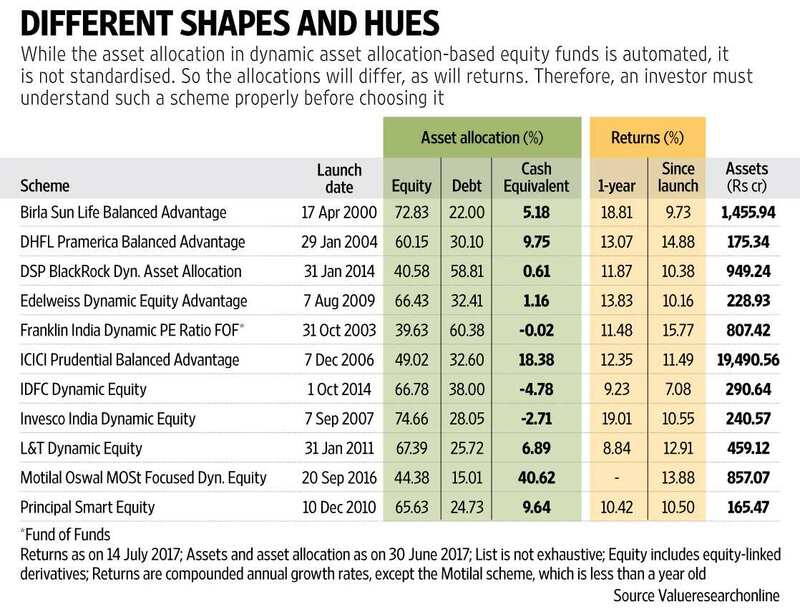 Over the last 2 years, the concept of asset allocation has taken a stronger foothold in the mutual fund industry. Now with the broader market valuations reaching close to the historical peak, the concept is getting spoken about even more. Older asset allocation funds like monthly income plans or balanced funds were static in nature—they invested in debt and equity in the same proportion regardless of market conditions. However, for the new launches (in some cases existing funds have changed their investment strategy), strategy has evolved to dynamic shifts in the debt equity allocation based on market conditions. These funds, known as dynamic asset allocation funds, switch between equity, equity-linked derivatives and debt—based on quantitative models linked to valuation. In the recent CFA Society India Wealth Management Conference in Mumbai, S. Naren, chief investment officer, ICICI Prudential Asset Management Co. Ltd, talking about multi-asset funds, said that while asset allocation is a highly talked about concept, it is not always practiced in its true form. ICICI Prudential Balanced Advantage Fund, their flagship dynamically managed asset allocation fund, stands at nearly Rs19,500 crore assets under management (AUM). Axis Mutual Fund is the latest entrant in this category, with its Axis Dynamic Equity Fund (11 to 25 July 2017). Apart from the above, there are at least 10 funds with a combined AUM of Rs5,600 crore, which also offer equity investing through dynamic asset allocation. Asset allocation means investing portions of your money in more than one asset to bring down the risk. In case of dynamic asset allocation-based equity funds, the proportion invested in equity, equity-linked derivatives and debt is managed actively, based on market-valuation metrics like price-earning multiples, price to book value of the benchmark index, market momentum indicators, and so on. These funds address counter-cyclical asset allocation by investing more in equity when prices are low and reducing the amounts as market gets more expensive. According to R. Sivakumar, head-fixed income, Axis Asset Management Pvt. Ltd, “The objective of the fund is to provide a more efficient way to allocate to equity across market cycles. Data clearly shows that investments in equity increase close to market peaks and investors shy away when market valuations are low. Data also shows, you are likely to earn a low return (in the near term) if you start investing when market is already at a high price-earnings multiple or close to market peak." At the peak of the market in January 2008, equity funds saw a combined inflow of around Rs15,000 crore, the highest inflows in that cycle. However, what followed was a return of negative 20%—from January 2008 to December 2008. Many investors who followed past returns, entered at the peak and lost out. Dynamic asset allocation funds, by doing the opposite in a disciplined manner, strive to participate in equity returns but at the same time reduce the short term volatility, which can scare away investors. For few of the funds in this category, the rebalancing triggers and frequency are clearly specified in the scheme information document (SID). For others, there could be internal valuation models that are relied upon, but these are not specified in the SID although they may be communicated through other fund literature. There are also varying degrees of fund manager discretion for such changes. According to Ashish Somaaiya, chief executive officer, Motilal Oswal Asset Management Co., “If you don’t have a specific model, adjustments in asset allocation can get linked to any metric. Investors and advisers, who subscribe to this concept, like to know the process. Markets can continue to move up or become volatile— asset allocation can’t be left to subjectivity." Such dynamic asset allocation models tend to sell equity on upward movement and reinvest in debt, because of which returns in a bull market will be lower than pure equity fund returns. However, immediately after a bull market ends is when the benefit of these funds can be seen the most. Soumendra Nath Lahiri, chief investment officer, L&T Asset Management Ltd, says, “This is a basic fund for investors to begin with equity investments. Returns can stand out should one invest through a cycle as investments increase during corrections and play out later." If you are an experienced equity investor, who is looking for long-term returns after 7-10 years, you may not be interested in this type of fund. In a 10-year plus period, regardless of the interim volatility, diversified equity funds have delivered an average 12% return. For dynamic asset allocation funds in the domestic market, the overall long-term return experience is yet to be seen. According to Amol Joshi, founder, PlanRupee Investment Services, “This model forces the fund manager to allocate higher amounts to equity when the market is correcting, thus giving a better return experience going ahead. For new investors and those who are not too active, these funds provide a good platform for equity returns with lower risk." Keep in mind though, there is risk. First, while the asset allocation is automated, the equity and debt portfolio is actively managed. Here it is important to gauge the skill and ability of the fund manager. Somaiyaa says, “Regardless of the model, performance comes from selection of equity stocks. Even if equity allocation is lower than debt, any sharp negative volatility in stock prices can wipe out returns." Secondly, when asset allocation is changed too frequently, which can happen here, there is always a risk of missing out on returns, being over-hedged or missing the downside protection when the fall is too sharp. Combine the two conditions above and overall returns could look substantially lower than plain-vanilla equity funds in some periods. Lastly, there is no standardized model that these funds have adopted. Each fund runs on a proprietary model to determine the dynamic asset allocation. Hence, it is difficult to build in return expectations in advance. In some cases, funds management discretion is also high. The effectiveness of one over the other will be known when all the funds have experienced varying market cycles and returns can be compared across those. Investors too have to remain invested over an entire cycle rather than for short periods. You may question whether asset allocation should be dictated by the adviser or by the product itself; but this is a choice that you will have to make based on your preference. The good news is that choice exists. If you don’t want to make those difficult asset allocation shifts yourself, you can simply leave it to a fund manager and his quantitative model.